Bored Death Theater is another point & click, escape game by bored. here is no escape from this Death Theater! 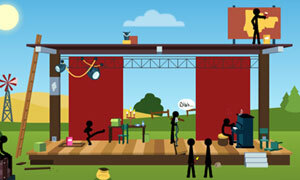 Funny stickmen are preparing for a concert. Put an end to the fun and leave no survivors. This game is similar to ClickDeath and Causality except the stickmen can see each other die! Good luck and have fun.